HangTuff Hanging Aluminum Anode is a 2-1/2 pound aluminum hanging anode with 15 ft. vinyl coated galvanized steel cable and and stainless steel plier clamp for grounding. The anode features Mil-Spec aluminum alloy with a galvanic voltage of -1.10v to offer the highest level of corrosion protection in salt or brackish water. Hanging anodes are a very popular accessory for dockside protection. Boat owners can readily extend the life of their shaft and propeller anodes by connecting a hanging anode to a vessel’s bonding system (e.g., a shroud line on sailboats) and lowering the anode overboard into the water. Hanging anodes are strongly recommended for corrosion protection of vessels with metal hulls; sailboats with limited anodes; and power boats with outdrives and outboards. HangTuff™ is a new and improved generation of hanging anodes designed to provide reliable, long-term corrosion protection. 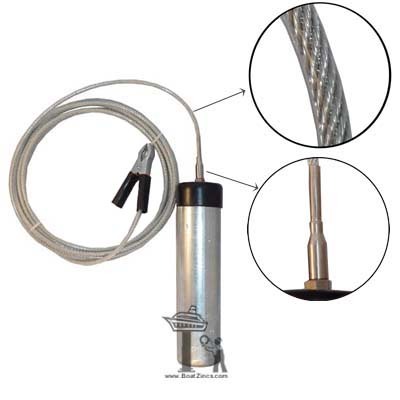 Unlike earlier products, the HangTuff's cable connection is 100% guaranteed not to fray or break during the life of the anode, and includes a stainless steel plier clamp (not copper!) that's corrosion resistant. 2-1/2 pound overboard aluminum anode with galvanized steel cable and stainless steel plier clamp for grounding. 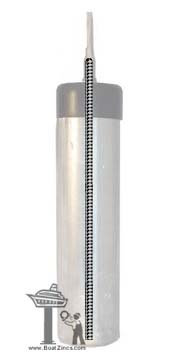 Threaded stainless steel rod cast into the full length of the anode's body. Swaged stainless steel connector that ensures the cable connection will not fray or break. Anode Dimensions: 2" diameter, 8" long. Includes plastic bump guard cap. Cable: 15 feet vinyl coated 3/16" galvanized steel cable. Flexible 6x7 rope construction. 2000 lbs breaking strength. Stainless steel plier clamp for electrical connection to boat. Compatible with #8 AWG (blue) crimp lugs. the full length of the HangTuff anode's body.